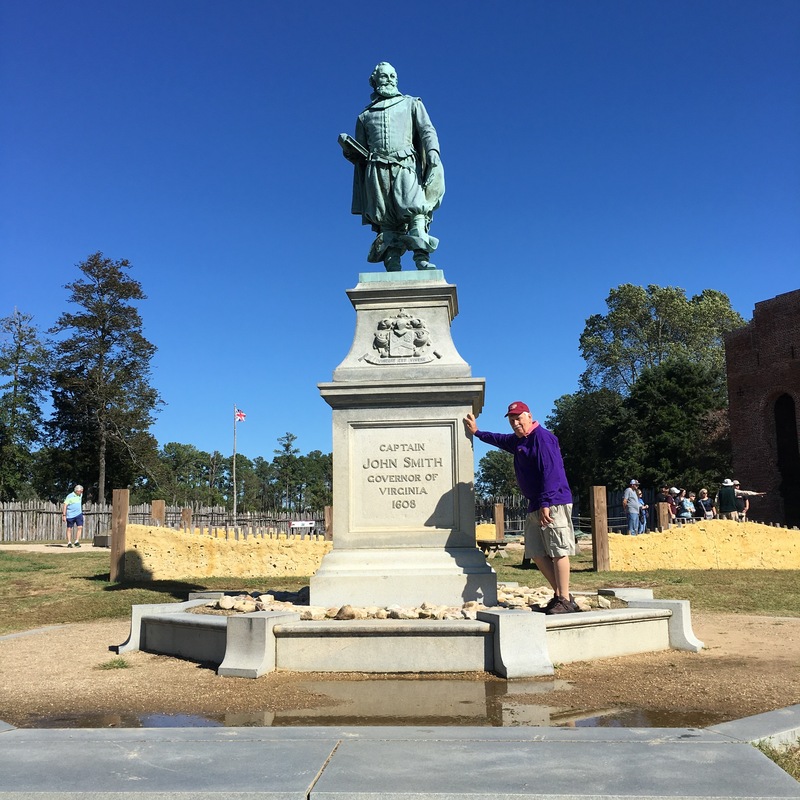 Jamestown Musem – Let's Go RVing! Today started very early as we were to meet for breakfast at Denny’s at 7:30! That’s an early start but it gave us a chance to meet some more people. We sat with a couple who serve as the At-Large representatives and they explained their responsibilities with Newmar. Next we all met at the Jamestown Settlement. Jerry and I had visited the Jamestown museum a couple of years ago but had never been to the Settlement. We had a very informative, interesting and entertaining guide. Someone commented that if they had had a history teacher like that they might have paid more attention. He took us through the stages of Jamestown Colony 400 years ago. In 1607 ships carrying 144 passengers and crew landed and anchored in the James River after spending 144 days at sea. Amazingly only one death was reported and most likely that was from heat stroke although that is not definite. The Virginia Company of London as “James Fort” was established on May 4, 1607 funded by a group of London investors. One of the first things the settlers did was build a fort with a wall as the Powhatan tribe of Indians was there and not very friendly! Hard times were ahead for these men when disease and starvation hit in 1607. I cannot imagine the desperation that would lead to cannibalism but it definitely occurred then. Diseased bodies were thrown in dug pits, some on top of each other and buried without benefit of caskets or preparation. Finally in 1610 when they decided enough was enough, the entire company boarded the ship and headed home only to be met by Lord de la Warr with supplies, new settlers and an order to return. 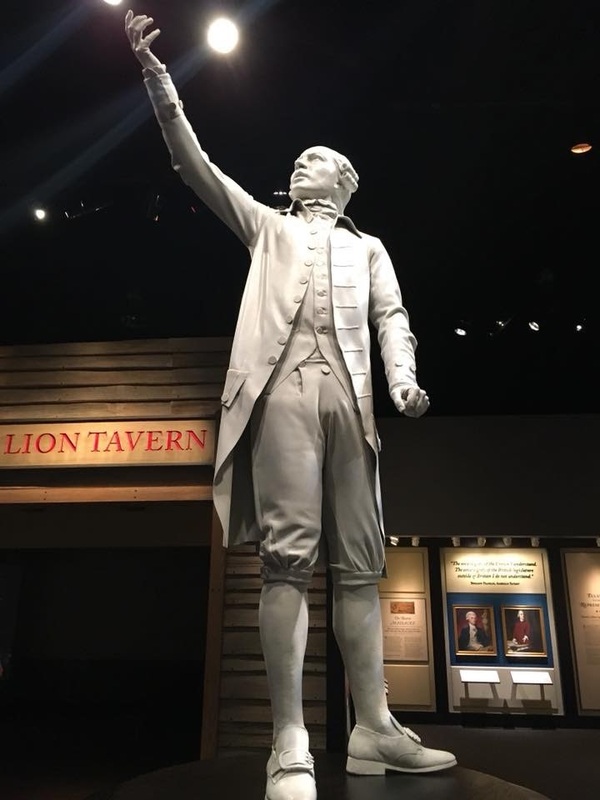 Return they did and they established forever the first permanent colony in the New World leading to the establishment of the House of Burgesses, the first representative assembly in America. We were able to go into the Memorial Church which was built in 1907 but only as far as the front as archaeologists were busy working in the remaining section. We also visited the Archaearium where there are many artifacts plus a glimpse into the lives of the people. Fortunately before we went on the guided tour I asked Jerry to go back to the car and get my raincoat. Had I not done that I don’t think I would have been able to finish the tour as it was windy and cold with the wind blowing off of the river. When we went into the Archaearium gift shop Jerry ended up buying a pretty long sleeved T which he put on over his short sleeved shirt. For him to say it’s cold, its cold! Although we didn’t have to be at the museum until later we headed on over remembering that they had a café there. We got a bite to eat and visited with the Regional Director and some others. 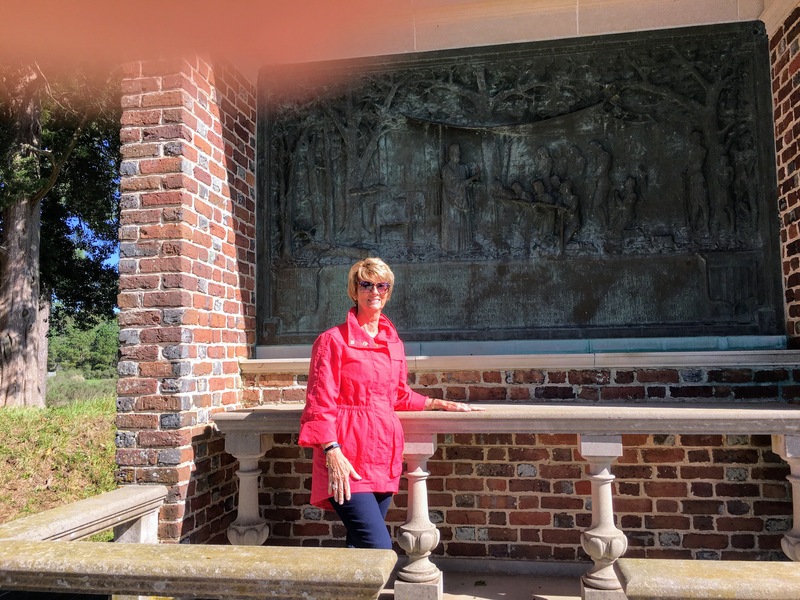 We also visited with the North Carolina State Director Becky along with her friend Phillip who encouraged us to join the NC Chapter, the Tarheels. She gave us the application and we filled it out right there on the spot plus paid the dues, a whole $10! Looking forward to some local rallies. When Jerry and I visited the museum before we wandered around on our own but this time we had a guide for over an hour. Although it would have been nice to spend more time in the different sections that was not possible with such a large number on the tour. Still, we learned a lot more than before. Hopefully we’ll be able to retain it! Of course most of it we heard in one form or another when we were at the Settlement but this just emphasized it. It is definitely a grand museum and worth the visit. While riding his bike the day before Jerry had broken his mirror while trying to adjust it so after leaving the museum we attempted to find a bike store. Thank you Google. We found a store, he bought the mirror and got me a light for my bike as well. We returned to the campground and spent the rest of the afternoon enjoying the cool weather outside. Jerry cleaned out his tool box and mounted the mirror on his bike. All of the Kountry Klub members met for dinner at Sal’s by Victor. I couldn’t believe how crowded it was on a Tuesday night and was hoping that was a sign of good food. We ended up seated with several of the North Carolina members and had a delightful time. The food was good and the company was great. In fact when we finally got ready to leave we looked around and realized that the other 90 some members had already left.